I love designing airline ticket invitations and working with Sian and Andy was great fun. They had a beautiful picture they wanted to include from a recent holiday and when I saw it I knew it was going to be the perfect way of personalising their stationery. "Having always planned to get married in the Dominican Republic, when we got engaged this year, we couldn't wait to start organising our big day. Of course one of the first things was invites, but we needed something different....very different! I had no idea what I wanted and came across Kate's site. I thought her ideas were amazing and contacted her with some queries. She immediately sent me some samples in the post. Andy and I loved the idea of a flight ticket, but wanted a different picture to the standard ones. Kate suggested some pictures, but also encouraged us to use one of our own very special photos. I was worried initially that it would look tacky but Kate worked her magic. She took our photo and turned it round and extended it and made it into a truly beautiful personal invite, especially as the photo was taken in the same area of the Dominican as where we are getting married. We can't wait to work with Kate again, nearer the time to sort out other stationary for our day. She is very easy to work with and produces truly beautiful amazing pieces." 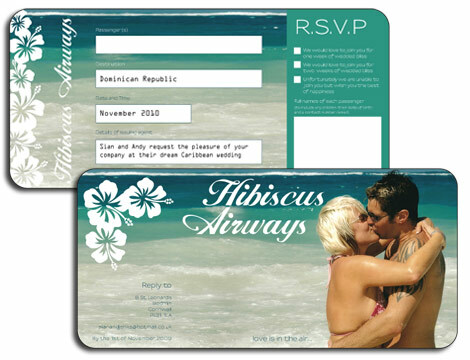 This is just one example of an Airline Ticket Invitation which incorporates a picture, click here to see some more examples. Contact me if you have your own photo you'd like to include in your wedding stationery and together we can create a unique invitation or save the date for your big day.